Part 3 of our breakfast series! 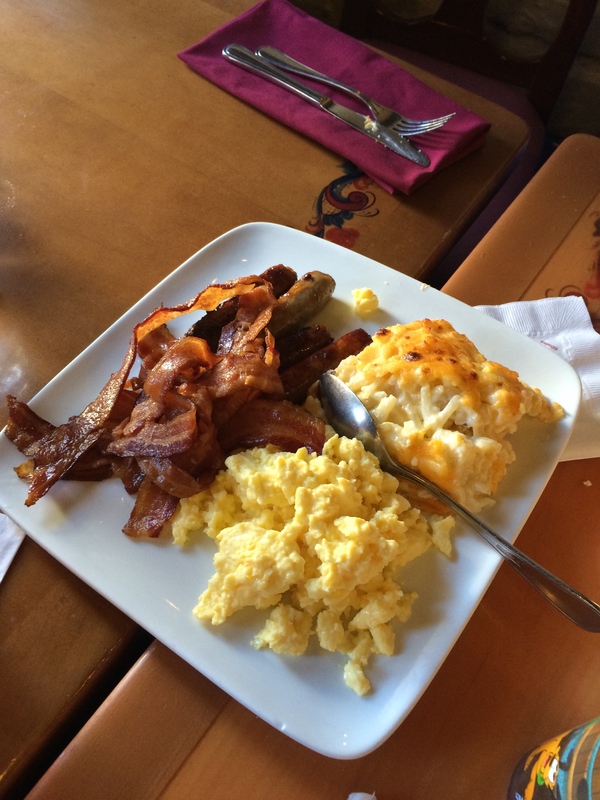 Where can you find a good breakfast at Animal Kingdom? Pizzafari Pizzafari is a great place to use a quick service credit for breakfast at the Animal Kingdom. From a bounty platter featuring eggs, bacon, sausage, french toast, potatoes AND a biscuit to a creamy ancient grain hot cereal (oatmeal, quinoa, and barley) with salted caramel crumble there are some interesting choices for your first meal of the day at Animal Kingdom. Pizzafari also has a breakfast burrito and breakfast croissant sandwich on the menu, in addition to other assorted pastries, danish and more. Tamu Tamu Refreshments The menu at Tamu Tamu refreshments changes often, but it has been known to feature a breakfast flatbread that is delicious! Another major benefit to Tamu Tamu is it’s location: close to Kilimanjaro Safari, making it a perfect place to stop and grab a bite to eat if you have a few minutes to burn before your FastPass+ return time. Rainforest Cafe Rainforest Cafe at Animal Kingdom serves a table service breakfast. From Belgian waffles to steak and eggs the Rainforest Cafe boasts a large menu sure to please even the pickiest of eaters. To make the most of your morning at Animal Kingdom we suggest making a pre-park opening breakfast so when you’re finished eating you’ll be able to enter the park through the Rainforest Cafe’s entrance to the park, which is separate from the main gate! Tusker House We’ve mentioned many times here at Dole Whipped that Tusker House is a hidden gem at Disney World. With great food and amazing character interaction, Tusker House is the perfect place to have breakfast at the Animal Kingdom! Though there are no character guarantees, Tusker House usually features host Donald Duck as well as Mickey, Minnie, Goofy and Daisy, all dressed in safari gear! 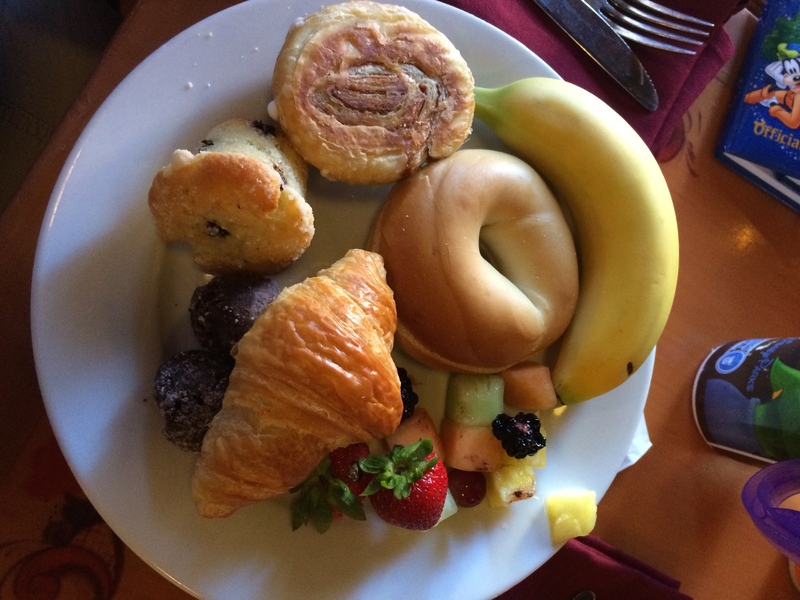 The breakfast buffet consists of typical breakfast fare: Mickey waffles, bacon, sausage, scrambled eggs, pastries, fruit and more. 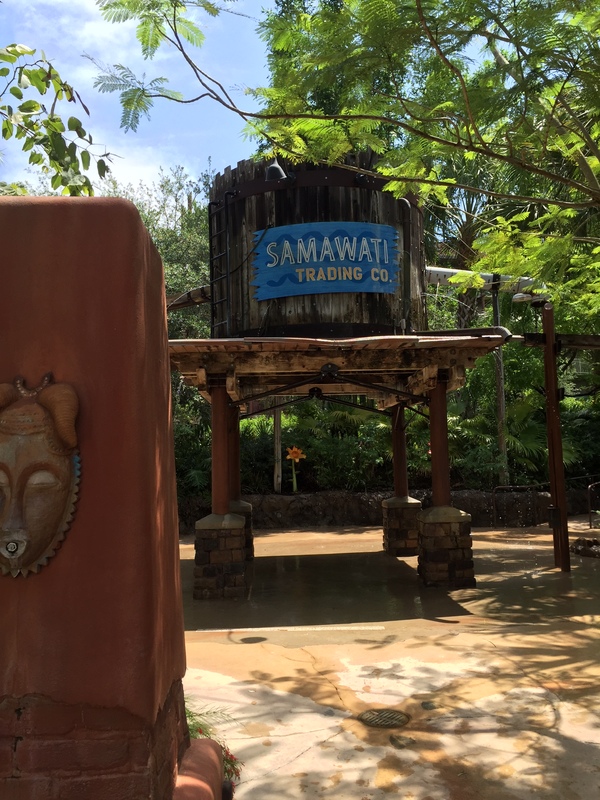 In addition to these locations you can also grab a quick snacky breakfast to go at many kiosks around the Animal Kingdom like the Harambe Fruit Market or the soon to be opened Starbucks at Animal Kingdom. 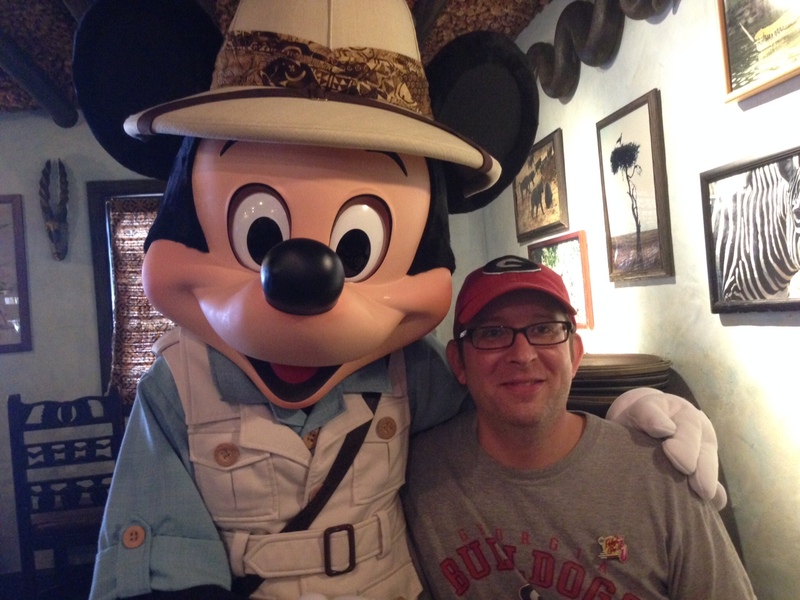 When to visit Walt Disney World is a much debated and purely personal decision. There are many factors to consider when deciding which time of year is right for your family. If you’ve got kids, you need to think about whether you want to pull them out of school, time off work can be a problem, not to mention the traffic at the parks themselves. I’m going to give you a list of considerations to include when trying to decide when to plan your trip. Do you loathe hot and humid weather? Yeah, me too. If you have a hard time not melting in the heat, stay away from Florida from May to October. The summer heat and humidity are brutal. If a little warm weather is just what you’re after, September (after Labor Day) is a great time to visit as crowds tend to be lighter. Ain’t no party like a Disney party! If you want to experience Halloween like you never have before, visit in the fall when Mickey’s Not So Scary Halloween Party is happening. 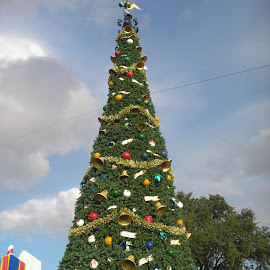 If Christmas is more your speed, wait a few months and go for Mickey’s Very Merry Christmas Party. These events are seasonal and include lots of magical things you can’t see without a party ticket! 3. May the force be with you. Have you got a Star Wars fan in your family? 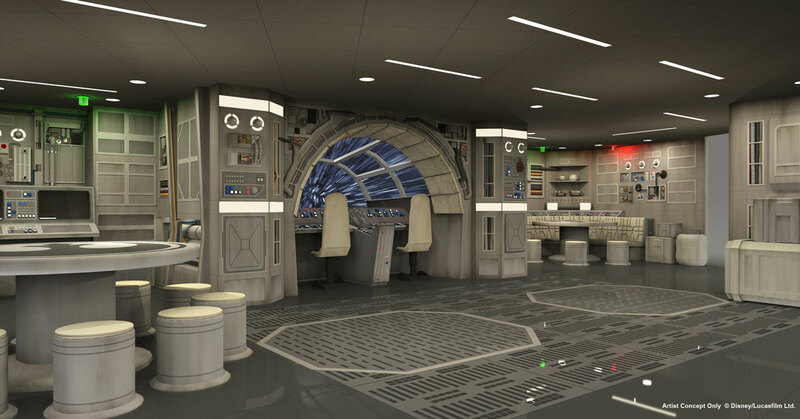 You might enjoy going during Star Wars Weekends. These run in May and June at Disney’s Hollywood Studios and include lots of special Star Wars events you can’t see other times of the year. Mickey and the gang show up in Jedi gear and there’s even a special Star Wars character meal! If you’re a foodie or a wine connoisseur, you’ll want to head to Epcot’s Food & Wine festival. This runs from September to November and includes lots of special food kiosks just for the event. Crowds tend to be a bit heavier, especially on the weekends, but is still manageable. If crowds really aren’t your jam, avoid all holidays, including Christmas, Easter, New Year’s Eve, and Independence Day. The parks are packed to the gills and you could even get turned away at the gate. Avoid, avoid, avoid. 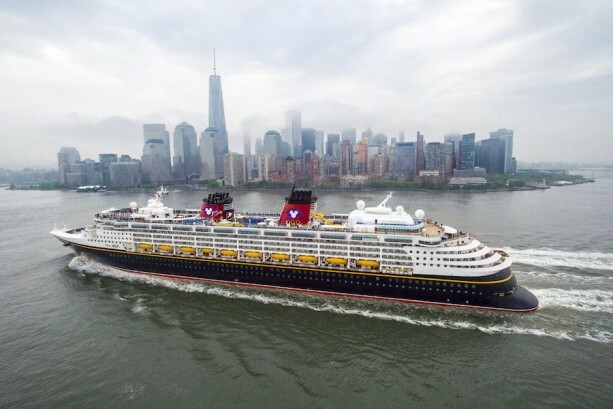 *Disney recently announced fall 2016 sailings and the biggest excitement was the return to New York! Along with the Big Apple Disney will be sailing from Miami Fl and Galveston TX. The sailings from New York to the Bahamas includes a stop at Walt Disney World and includes a park hopper ticket plus round trip transportation. And of course since you are in the Bahamas a trip to Castaway Cay is in order. Also there will be one five night sailing to Canada with stops in Halifax, Nova Scotia, and Saint John, New Brunswick. In Miami, they are now offering seven night sailings to the Western and Eastern Caribbean and all will include a stop at Castaway Cay. Galveston will also feature seven night sailings for the Bahamas and Western Caribbean and even a four night to Cozumel, Mexico. These booking open May 20th so get with your trusty travel agent to get yourself booked! *River Cruising was announced earlier this year by Disney and they have now added two more sailings for 2016. The first is a seven night Budapest, Hungary to Vilshofen, Germany on the Danube. It includes stops in Slovakia and Austria. *Halloween on the High Seas for 2015 has been announced! *The Very Merrytime Cruises for 2015 have also been announced! *October 4-24, 2015 the Disney Dream will go into dry dock and there will be some really exciting changes coming to the ship. 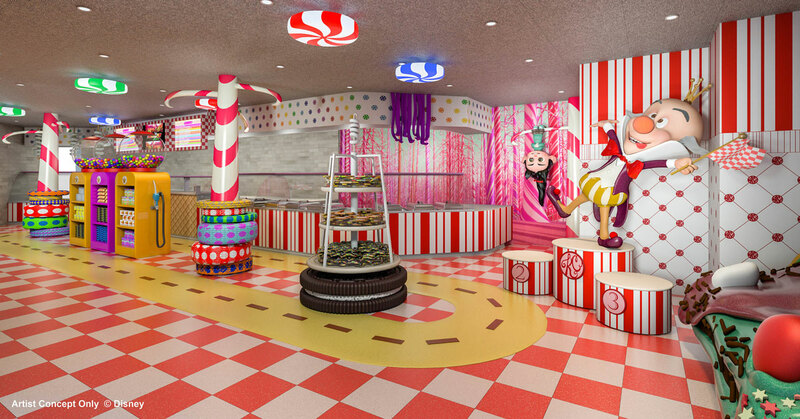 There will be a new Star Wars themed area, a candy store insprired by Wreck it Ralph and the addition of Bibbidi Bobbidi Boutique! But Disney didn’t forget the adults, they will also be adding Satellite Falls to the Dream, this is an adults only area sure to please. *With the coming addition of a Rapunzel stage show we just don’t know what we are most excited about! 2015 and 2016 are going to be the best time to take a Disney Cruise! If you think there’s nothing new to try at Walt Disney World, then this episode is for you! Tara gives us the low down on all the new things she tried during her recent trip and we hope she inspires you to do some new things on your next trip! 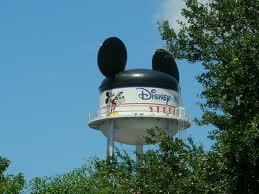 Have you been dreaming of taking your family on the perfect Disney vacation but you’re afraid you can’t afford it? I have some tips that will help you save money and make those dreams a reality. 1. Travel during the off-season. People will say that there is no off-season at Disney and that’s not entirely true. There are certain slower times of year that are perfect for visiting. There is usually some kind of discount for those times as well and using that will definitely save you money! 2. Think twice about the dining plan. 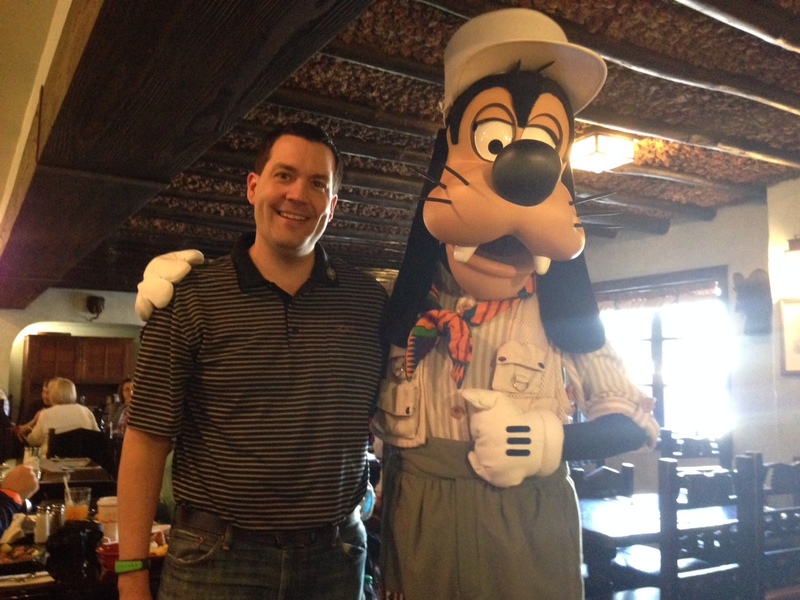 While extremely convenient, the Disney dining plan is not always a cost effective option. Think about how you and your family eat, especially when you’re on vacation. Price out a typical food day using the menus on Disney’s website to see if you’ll even eat enough to justify the cost. If you plan on doing at least one character meal, the dining plan can save you some cash, since those meals tend to be more expensive. 3. Consider getting a travel incentive credit card. There are many different kinds of credit cards that offer a cash back or similar incentives on everyday purchases. 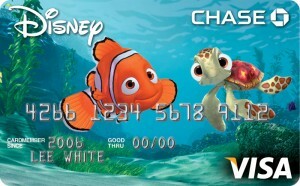 A lot of people use the Disney Chase Visa for their Disney vacations. One other perk with the Disney Visa is they sometimes offer promotions to cardholders first before it’s release to the general public. Did you know you can bring your own food and drinks into the parks? There are certain rules like no glass or coolers, but you can definitely bring your little one’s favorite crackers and juice. Bringing in your own snacks and drinks can save you from purchasing more expensive snacks at the park later on, saving you a wad of cash. 5. Purchase autograph books and costumes offsite. This is kind of a no-brainer, but purchasing autograph books and pens at the parks can be more expensive. The Disney store website often has Disney Parks products on sale and purchasing them beforehand can save you some money. Same goes for Disney costumes your kids might want to wear to the parks. 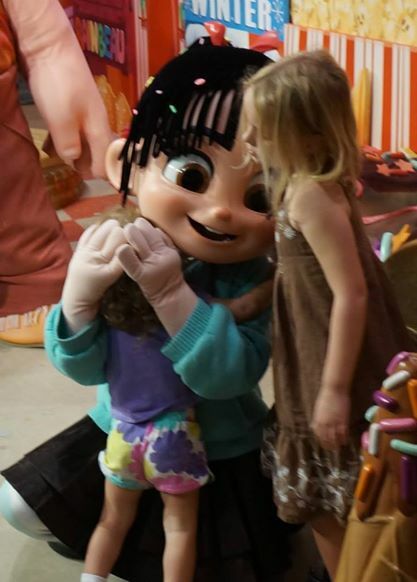 What’s your favorite Disney vacation money saving tip? Leave it in the comments below! 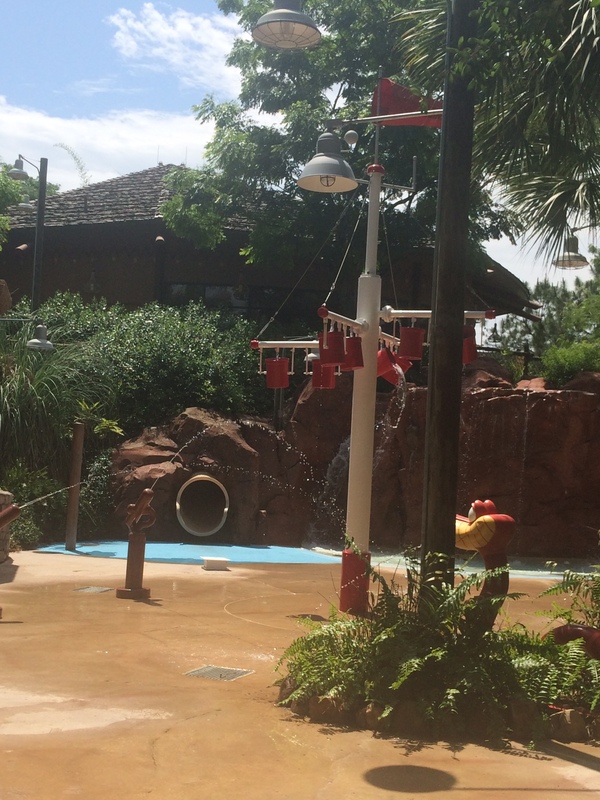 The whole pool area is great and the kids play area is super cute! 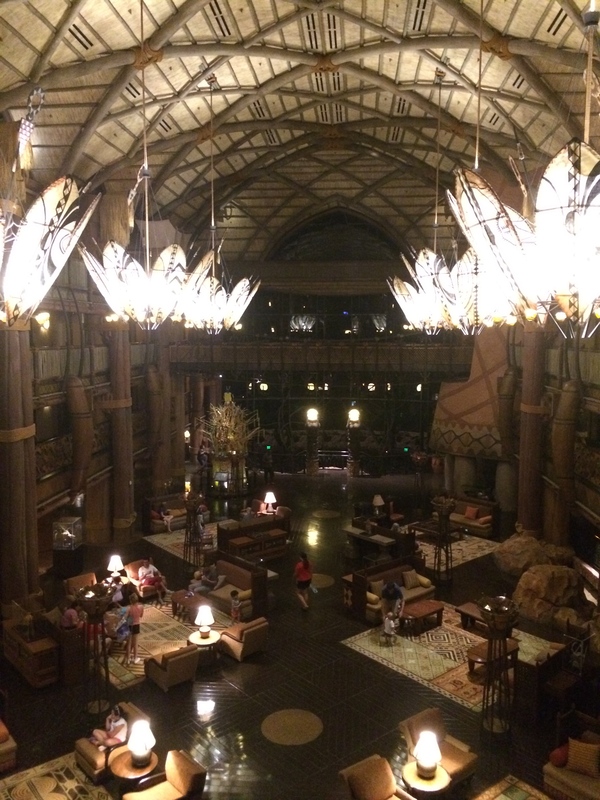 On my recent visit to the World we were lucky enough to be able to stay at Animal Kingdom Lodge. 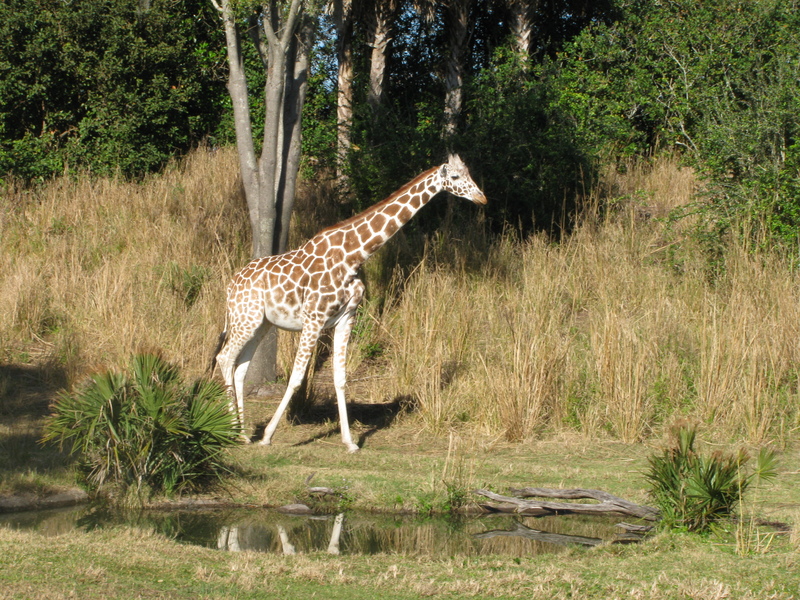 Animal Kingdom is a favorite for many, including myself, but I had not stayed there in a few years. On this visit we stayed in a one bedroom villa in Kidani and LOVED it. 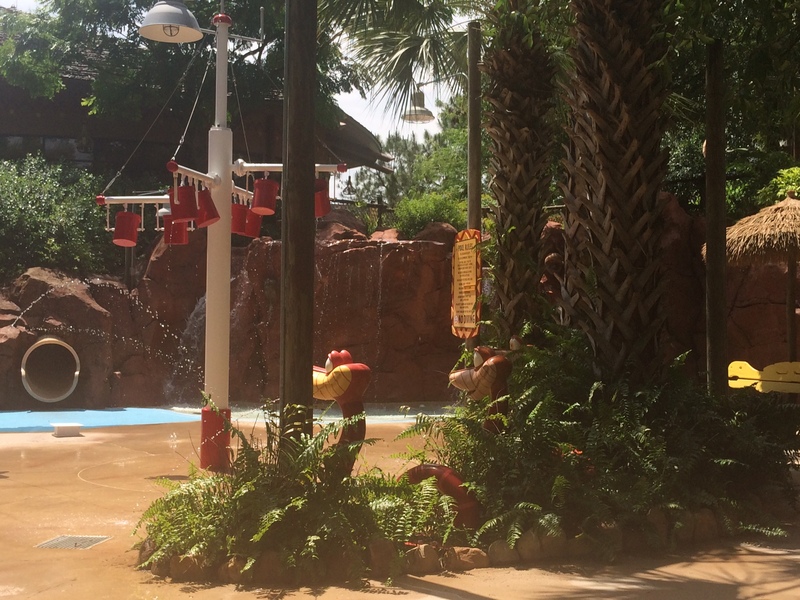 One area I have never heard about it is the pool area at Kidani called the Samwati Spring Pool and the kids pool area at Kidani. 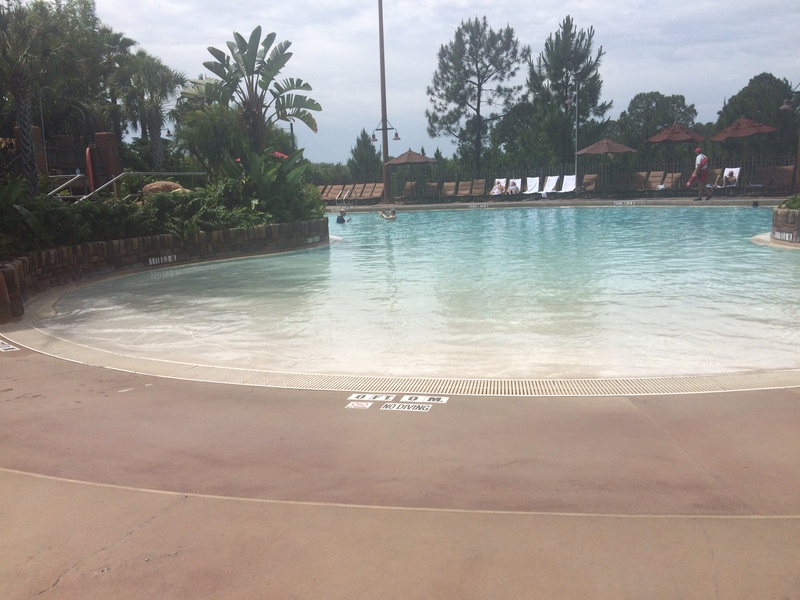 It is never mentioned in passing when talking about the pools and so I just assumed Kidani’s pool in general was a standard Disney pool (great but nothing too special). Well I was wrong. The pool area for everyone is very nice, chairs are great and it has The Maji Bar for when you get hungry or need a cold drink. One of the great things is it was never very crowded and the theme is the African Wilderness so the decor and ambience is amazing. They do have games like Bingo and trivia and Movie Nights so make sure to check the schedule if you want to partake or avoid these times. I was exploring the area and came upon the kids area and was fascinated by how much there was for kids to play and the music piped in and seriously hidden gem. 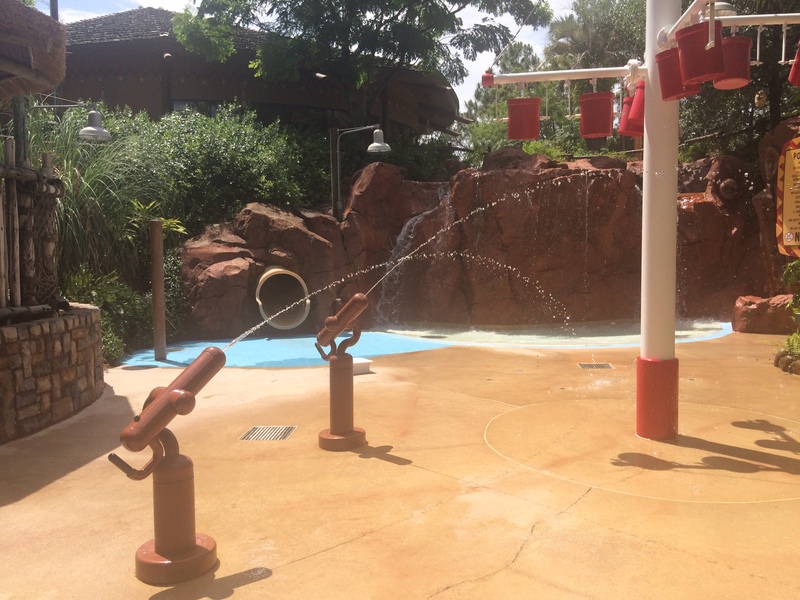 It is a large interactive water play area intended for kids under 48″ tall. In addition there are two water slides at the Samwati Springs Pool which is great. 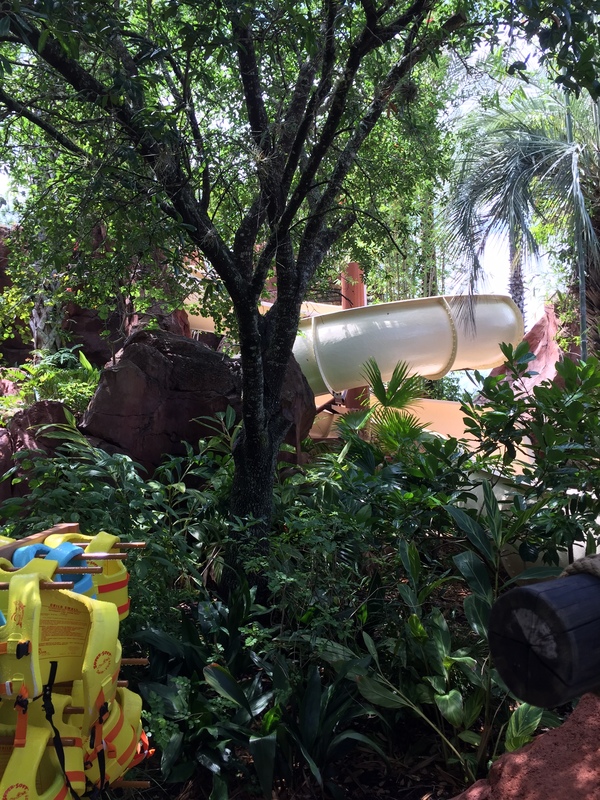 One is a traditional larger slide intended for the big kids and then a smaller slide that is just for preschoolers. In addition it has a zero entry access at the pool and so once again a great option for the little ones! So, I thought I would share some pictures of the area so you can see how special it is and it may be great for your next vacation. Splashes of water to run through are everywhere! 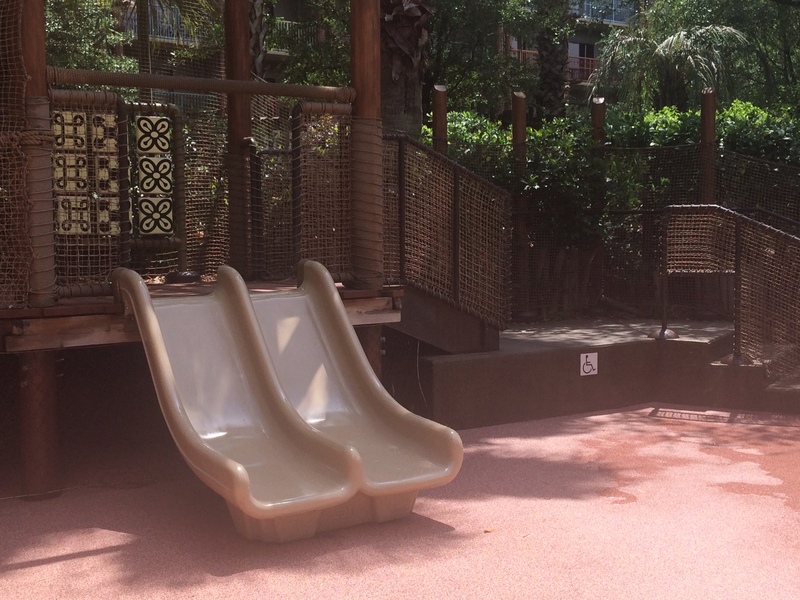 The jungle gym set and slide are just the right size for your little ones! 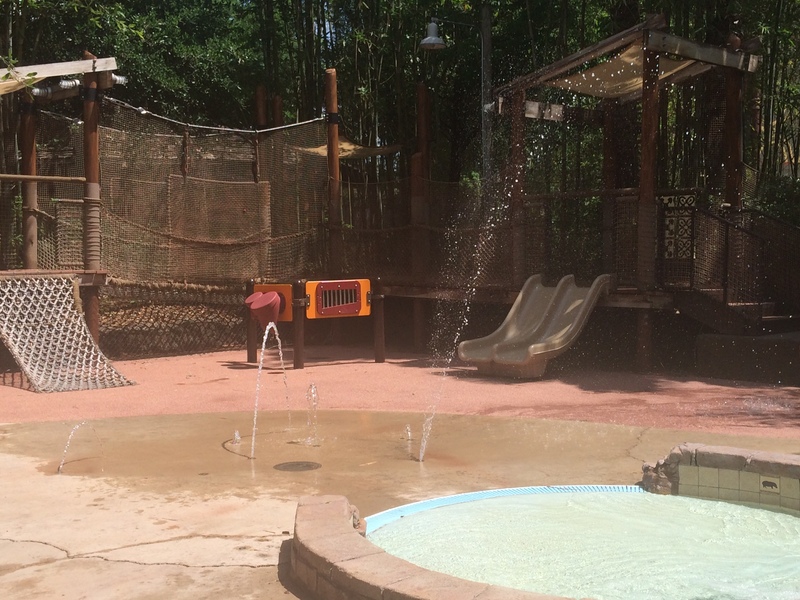 The water pulley system helped keep you cool as you played! Mom and Dad can hang out in the hot tub while all the fun is going on around them! Do not be afraid to climb up the big rock slide! 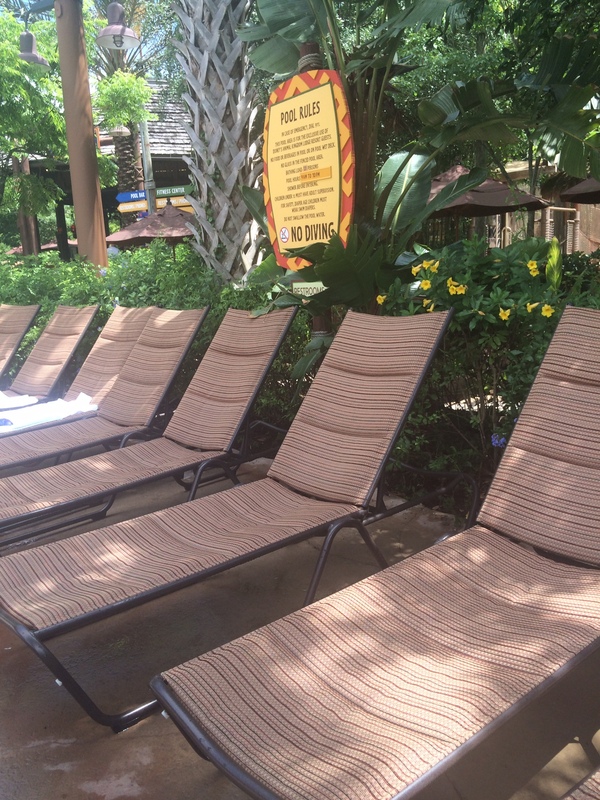 The main pool area is a great place to unwind and take a nap! Enjoy the lush plants and order a drink or sandwich at the Maji Bar and relax. 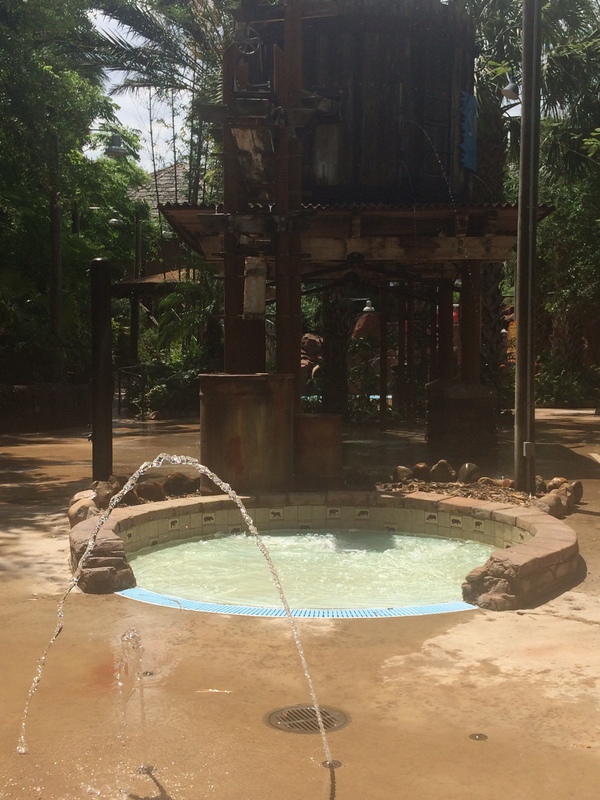 So have you been to this pool at Kidani Village in Animal Kingdom Lodge? What were your impressions? What is your favorite pool? If you’ve got a boy in your life that you want to bring to Disney but you can’t think of anything to do that doesn’t have to do with princesses and fairies, then this is a must-listen for you! We give you the low down on everything boy-centric at Walt Disney World. We’ve got ideas for rides, shows, restaurants, and more! Don’t miss it! A recap of your breakfast options at Epcot. To say there aren’t many options for breakfast at Epcot is a bit of an understatement! With the World Showcase not opening until 11am Epcot is usually a better choice for lunch or dinner, but if you do happen to have an early morning planned at Epcot there are still a few options for you. Starbucks Fountain View: The typical pastries and coffee are served at this Starbucks location but you can also find some more hearty offerings like breakfast sandwiches, wraps and smoothies. This Starbucks location also features an exclusive Epcot mug from Starbucks collectible “You Are Here” series (Magic Kingdom and Hollywood Studios also have their own mugs, as will the Starbucks Animal Kingdom location when it opens) so be sure to pick one up if you’re into Starbucks or Disney collectables… or both! Sunshine Seasons: Sunshine Seasons provides a more filling quick service breakfast if you’re looking for good fuel to start your Disney day. From breakfast platters featuring bacon, eggs, sausage and potatoes to a breakfast panini, oatmeal, bagels and more there is plenty to choose from. Consistently getting some of the highest ratings from guests for food quality, Sunshine Seasons is a great option for breakfast in Epcot. 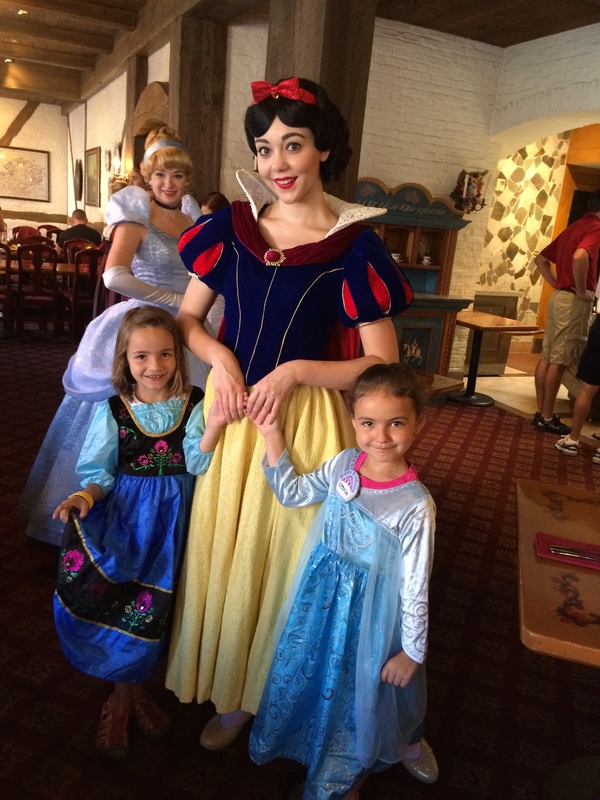 Akershus Royal Banquet Hall: The only table service breakfast at Epcot, Akershus is a do not miss for my family. For breakfast we all prefer Akershus to Cinderella’s Royal Table. The food is delicious and the character interaction is top notch! Plates of bacon, eggs, sausage and potato casserole are served to your table, and there is also a buffet of pastries, yogurt, fruit and more that is available to you. Akerhsus is a great way to start your day at Epcot! Animal Kingdom gets a bad rap and I admit I am guilty of adding to it. 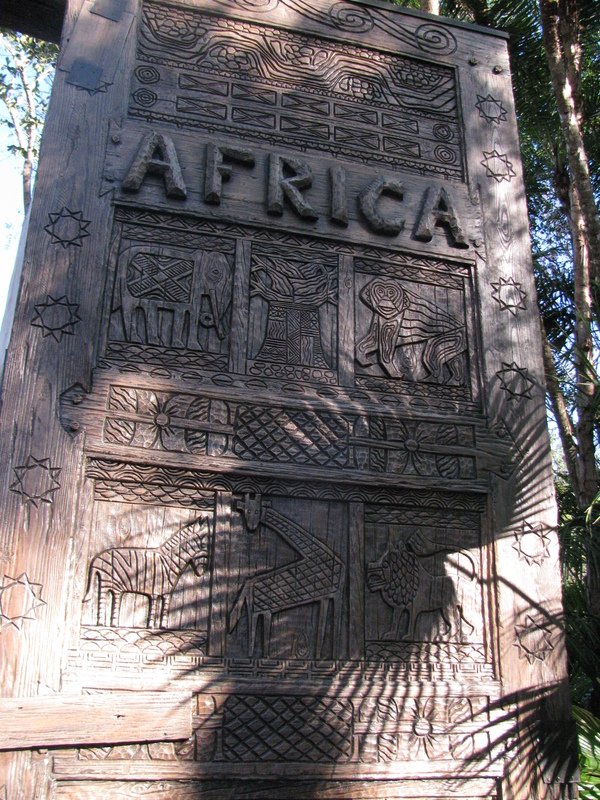 But to redeem myself here are some tips that you may find helpful when exploring Disney’s Animal Kingdom! The Kilimanjaro Safaris is worth doing more than once. 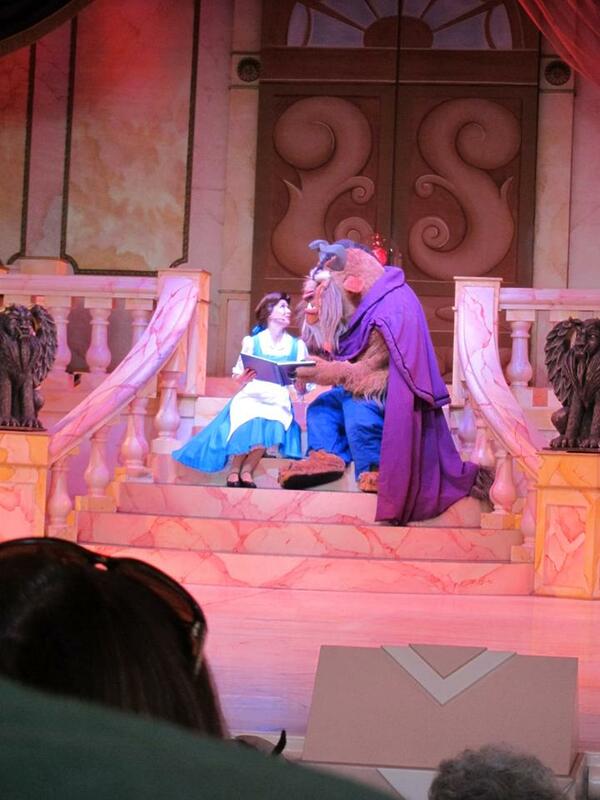 If you can get a FastPass+ for this for later in the day then go on first thing. The animals may be more active in the morning and no two rides will be the same. 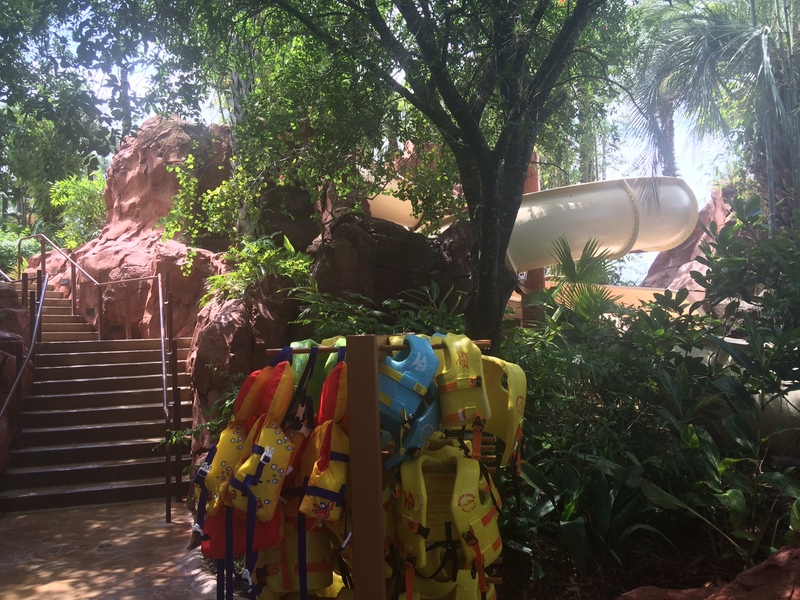 Save Kali River Rapids for the end of your day, unless it is really hot. This way you will not have to walk around the park in wet clothes all day long. Alternatively you could always wear quick drying clothes or take an extra outfit with you. There are lockers located near the attraction. Plan to take in at least one of the major stage shows. There are two great choices, Finding Nemo the Musical and Festival of the Lion King. Both are really well done and you can’t go wrong with either choice, but don’t waste a FastPass+ on it since there is plenty of seating for either. Plan a pre-park opening breakfast at Tusker House. You can get in the park early have a great breakfast and then be in the park back by the Kilimanjaro Safaris when the park opens. 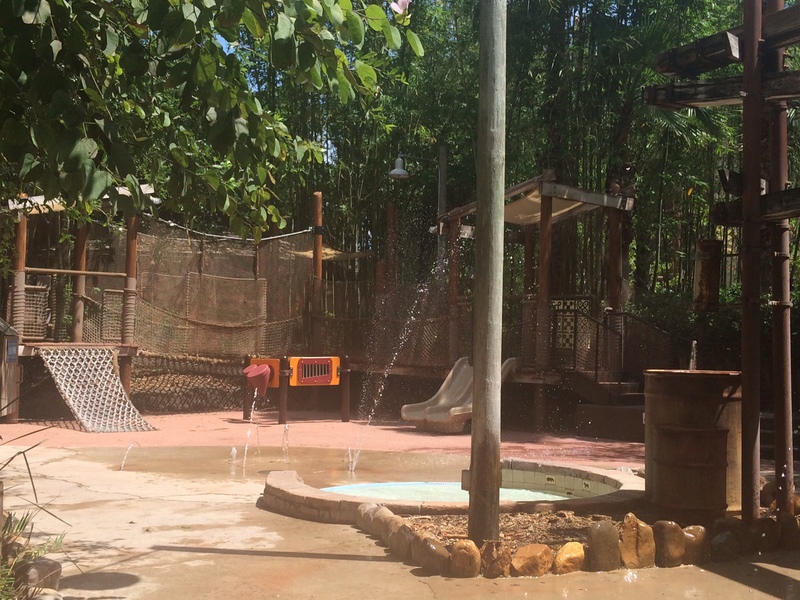 The Boneyard is a great place for kids to blow off some steam. Parents can also sit back and take a quick break while the kids play and dig. Check out the Wilderness Explorers and earn badges. You will probably learn a lot on the way and maybe explore parts of the park you would not have otherwise seen! Plan a dinner at Animal Kingdom Lodge. The restaurants in the park are fine but you will find some great places just a short bus ride away. Plus it gives you a chance to see this gorgeous resort and you just may plan to stay there next time. While Animal Kingdom isn’t the most popular park but there are some great attractions and shows here that are worth seeing!